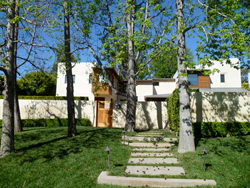 Yogachef, Joan Hyman & The Yurt in Brentwood invite you to spend a day in paradise without having to leave Los Angeles. Enjoy two yoga classes taught by Joan Hyman (a 2 hour flow in the mid-morning and a late afternoon class taught with David Lynch), saltwater pool and jacuzzi with an infrared sauna, al fresco organic vegetarian Indian lunch, ample sun lounging and an optional 30 minute or 1hour massage. The day in paradise will take place at a spectacular Brentwood home. Private, lush and appointed with every amenity. A true architectural gem with a recently built yurt that defies description. The home has three different lounging ares, an outdoor dining table for 14 and is nestled in a quiet and seren neighborhood. Joan Hyman teaches and practices yoga across the globe and locally with many popular vinyasa flow classes in Los Angeles. She has been teaching for twenty years and began teaching dance and fitness in her hometown of Philadelphia. She moved to Santa Monica Ca. in 2002 and completed the YogaWorks Teacher Training under the watchful eye of Maty Ezraty and Lisa Walford. She started practicing ashtanga yoga under Maty Ezraty whom she later assisted and mentored. Her love for flow didn’t stop and she mentored under “Vinyasa Flow Queen” Annie Carpenter. She received her YogaWorks Certification in 2006 and took her first trip to Mysore, India to study with the beloved Sri K. Pattihbi Jois and his grandson Sharath. She traveled to Sri Lanka after 2 months of study in mysore and met Prem Carlisi and Heather Duplex who also offered teachings on meditation, pranayama, and ayurveda whom she most recently visited at their retreat center in Ubud, Bali this past year. She continues to practice ashtanga daily under certified and authorized teachers including Tim Miller and Noah Williams and continues to grow in her teachings. Announcing the new yoga studio in Brentwood truly unlike any other around. Imagine a magnificent yurt surrounded by beautiful landscaping and nature in an utterly picturesque and serene setting. Envision evening classes by candlelight, gazing at the night sky surrounded by stars. As the skylight of the yurt opens, we take in the fresh beach air and are overcome with a magical feeling of tranquility.